In this segment Coach Barber gives an overview of the 100 meter dash. The various phases of the race are broken down and defined. You'll get a complete outline for how to coach the 100 meter dash. 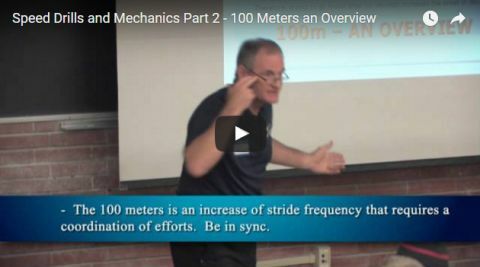 This is the first of many videos in the Speed Drills and Mechanics Series. In this lecture Coach Barber talks about developing training strategies based on the age of your athlete. A quick look at how to set up blocks for optimum power with your starts. Barber Track and Field is proud to present Dynamic Warm Ups. In this 4 minute video explore over 27 different dynamic warm up exercises.